Stockings, and the stuffing of them, might be my favorite part of the gifting traditions over the holidays. I find great joy in collecting all the gift ideas and stuffing them into those big ole’ socks. I love watching and listening as my loved ones exclaim with delight over all the little surprises they find inside. Sometimes I put big surprises in those stockings, too, like tickets to a stage production or sporting event. Aside from the requisite standbys: oranges, candy canes, chocolate Santas, Altoids and gift cards, it’s nice to include unexpected, truly practical, or just for fun items. 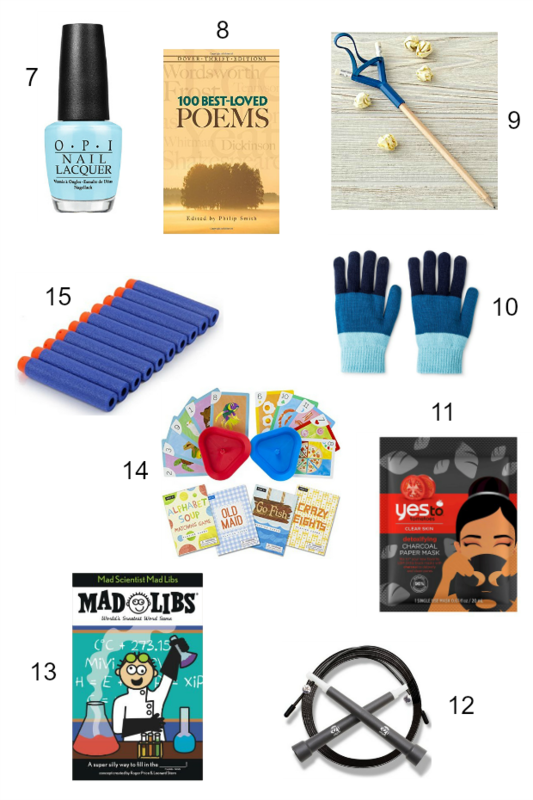 Here is our thoughtfully curated 2016 list of gift ideas and inspiration for stocking stuffers this season. 1 – Socks. Novelty socks are all the rage, for men, women and kids alike. We are partial to the quirky cool assortment from Woven Pear. So many darling patterns and color combos, with rave reviews for quality, it’s hard to choose a favorite. 2 – A water-resistant, portable, wireless blue-tooth speaker is bound to please. So they can jam to their sick beats in the shower, at the pool, or just about anywhere. It’s also a hands-free speaker phone. 3 – Rosebud Salve. Used for everything from minor cuts to chapped lips (with a hint of color!) to dry cuticles, and in such a pretty little tin. It even has a subtle fragrance that my kids love. There’s a reason it’s been around for years. 4 – How adorable are these little toy food trucks? Kids and grown ups alike will dig these. I know a certain someone with a master’s degree who would love a taco truck on his desk. 5 – Razors make great, practical stocking stuffers. We are sold on the Dollar Shave Club razors and replacement blades. That’s right, my hubby and I both use them. The price can’t be beat and the quality is great. So is the clever and humors monthly trivia insert. 6 – I have to admit I’m kinda in love with this little travel sized spirograph set. Sure it’s geared for kids, and will guarantee several minutes (at least!) of peaceful travel time, but I think I’d enjoy it myself!. 7 – Nail polish for any of the beauty lovers on your list. We are particularly fond of OPI, and they have so many fabulous shades with equally fabulous names. Just the right size and always a hit. Their Breakfast at Tiffany’s collection is extra good. 8 – A miniature book of poetry. Romantic, sentimental, artsy, literary, brainy. It covers several bases. For the closet poet, for the budding literary scholar, or for the diamond in the rough. 9 – Guys! It’s a pencil catapult. A catapult pencil. A catapencil. Sure to inspire some good natured office shenanigans. Maybe don’t send it to school with the kids. 10 – One can never have too many pairs of cozy tech-touch gloves. Readily available at any big box store or department store or specialty retailer. Every member of the family can appreciate them. 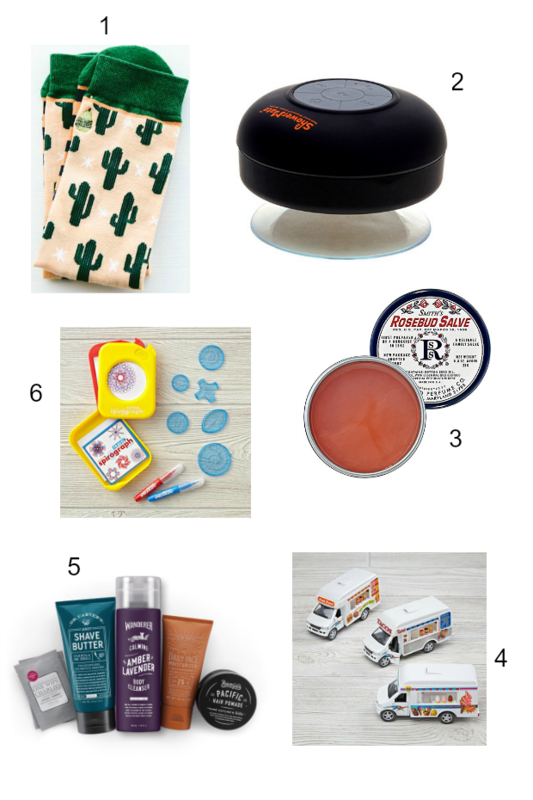 11 – Fancy charcoal facial masks are all rage right now, and these from Yes To Tomatoes single–use sheets (paraben-free) are just right for stockings. Also? These can easily be found at Target. 12 – Jump ropes! What a great idea! For cross-fit devotees, or for the playground double-dutch crowds, it’s a little dose of nostalgia plus a dose of fitness. 13 – I don’t think anyone ever outgrows MadLibs. Maybe someone will be inspired to put down the electronics and engage with the humans in the house. These are also great for trips. Include a funky pen or pencil for extra kicks. 14 – Same goes for card games. They are inexpensive, compact, portable, and suit all ages. Grandpa can enjoy Go Fish (or Skip-bo or Uno or Old Maid or Hearts) with the little kids, and everyone in-between, for some simple quality time. 15 – If you have any Nerf-type toy shooters hanging about, you know that spare darts are precious ammo indeed. Stuff those stockings with plenty of extras–they’re cheap. For more fun stocking suggestions, check here and here. Need some gift ideas for kids? Here you go. Ideas for guys? Check this out. Not sure where to find cute pajamas for the whole family? I’ve got your back. Classy gifts for the women in your life? I’ve got some suggestions. The techies you love will go crazy if you surprise them with this. And if you’re giving to the tender-hearted you can give this, or donate here. Gift ideas for everyone on your list!